A three day workshop on audio visual synthesis for creative computer scientists, programmers, musicians, and visual artists. The Digital Musics graduate program of the Dartmouth College Music Department is hosting a second annual workshop on Audio and Visual Synthesis from October 16 to October 18, 2015 in rural New Hampshire. The workshop is free to admitted attendees and includes meals and group lodging. The workshop is generously supported by Bregman Media Labs, the Graduate Program in Digital Musics, and the Neukom Institute. This workshop brings together creative computer scientists, programmers, musicians, and visual artists for a collaborative three day workshop on audio and visual synthesis techniques and applications. The workshop will be located in a remote setting where participants will have free reign to roam the grounds, take hikes, and gather by a campfire at night. The evenings include performances and collective AV synthesis improvs. We invite researchers and artists who are developing and applying new techniques for audio and visual synthesis. Please visit last year’s site to get a sense of what to expect. We’re accepting aplications for participation in any of the following categories. Tutorials are 30 minutes in length, with additonal time for questions. We encourage researchers and artists to submit abstracts on topics related to signal synthesis, performance, and composition. There will be several sessions during which attendees will set up posters and demos in parallel. Others will roam around for one-on-one conversations and discussion. Friday and Saturday evening will feature a short (~45 min) performace. The venue sits against a beautiful rural backdrop. This year we encourage suggestions for outdoor exhibits that take advantage of the setting. Please keep in mind that rain is a possibility; suggested installations should be weather-proof. Be able to attend the full workshop, beginning to end. Present their research or creative work in one of the above categories. If you attended last year’s workshop you may apply to attend this year. However, you must have new creative work or research to present. The soft deadlne for submitting to our call is September 25, 2015. Please see the wiki for up-to-date-schedule info. Pierce’s Inn is located in Etna, NH. There is lodging capacity for up to 40 guests and ample work space. Six meals will be provided. Hiking trails are located nearby and there is a large lawn to throw a frisbee, play croquet, or kick a soccer ball around. There is a drum set and piano on the premises. We encourage guests to bring their instruments. The Dartmouth Coach and Greyhound have daily buses to/from New York, Boston, and Montreal. We have arranged the workshop schedule around these bus schedules. We suggest that all bus tickets are booked early, as seats can quickly fill up. Other travel options include Amtrak Vermonter Line and Cape Air out of the Lebanon airport. We encourage participants to post on the wiki to offer or request car rides. Approximately one week before the event we will ask all drivers to volunteer for ride shares between Hanover and the venue. 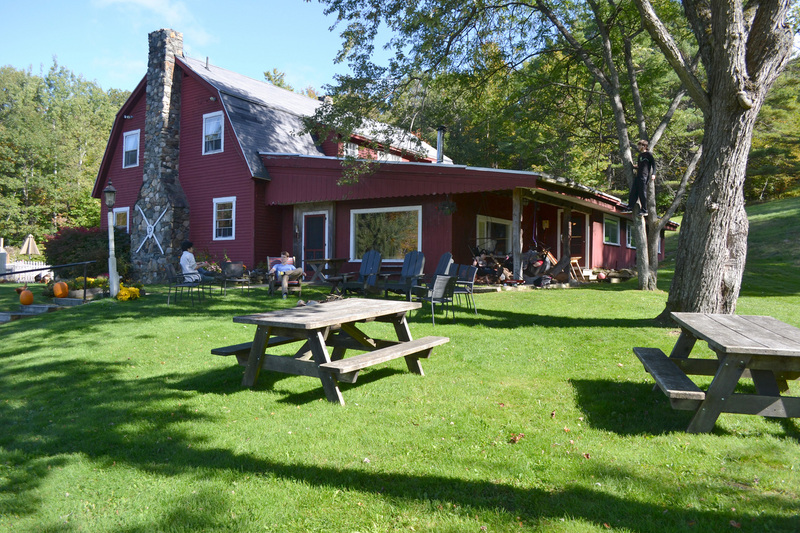 Pierce’s Inn is approximately a 13 minute drive from the bus drop-off point in Hanover. If you have a car, we will be relying on your generosity to help everyone get to the workshop. AV Synthesis Workshop for a larger map. © 2015 Bregman Music Audio Research Studio. Powered by Jekyll using the HPSTR Theme.